Background This study evaluates changes in sales of non-alcoholic beverages in Jamie’s Italian, a national chain of commercial restaurants in the UK, following the introduction of a £0.10 per-beverage levy on sugar-sweetened beverages (SSBs) and supporting activity including beverage menu redesign, new products and establishment of a children’s health fund from levy proceeds. Methods We used an interrupted time series design to quantify changes in sales of non-alcoholic beverages 12 weeks and 6 months after implementation of the levy, using itemised electronic point of sale data. Main outcomes were number of SSBs and other non-alcoholic beverages sold per customer. Linear regression and multilevel random effects models, adjusting for seasonality and clustering, were used to investigate changes in SSB sales across all restaurants (n=37) and by tertiles of baseline restaurant SSB sales per customer. Results Compared with the prelevy period, the number of SSBs sold per customer declined by 11.0% (−17.3% to −4.3%) at 12 weeks and 9.3% (−15.2% to −3.2%) at 6 months. For non-levied beverages, sales per customer of children’s fruit juice declined by 34.7% (−55.3% to −4.3%) at 12 weeks and 9.9% (−16.8% to −2.4%) at 6 months. At 6 months, sales per customer of fruit juice increased by 21.8% (14.0% to 30.2%) but sales of diet cola (−7.3%; −11.7% to −2.8%) and bottled waters (−6.5%; −11.0% to −1.7%) declined. Changes in sales were only observed in restaurants in the medium and high tertiles of baseline SSB sales per customer. Conclusions Introduction of a £0.10 levy on SSBs alongside complementary activities is associated with declines in SSB sales per customer in the short and medium term, particularly in restaurants with higher baseline sales of SSBs. On the 1 September 2015, Jamie’s Italian, a national chain of UK restaurants, added a £0.10 levy to the price of non-alcoholic SSBs sold within them. The prelevy price of SSBs ranged from £2.60 to £3.25 (excluding the levy), thus addition of the levy equated to a price increase of 3.1%–3.8%. Other non-alcoholic beverages were similar in price, ranging from £2.00 and £3.95. 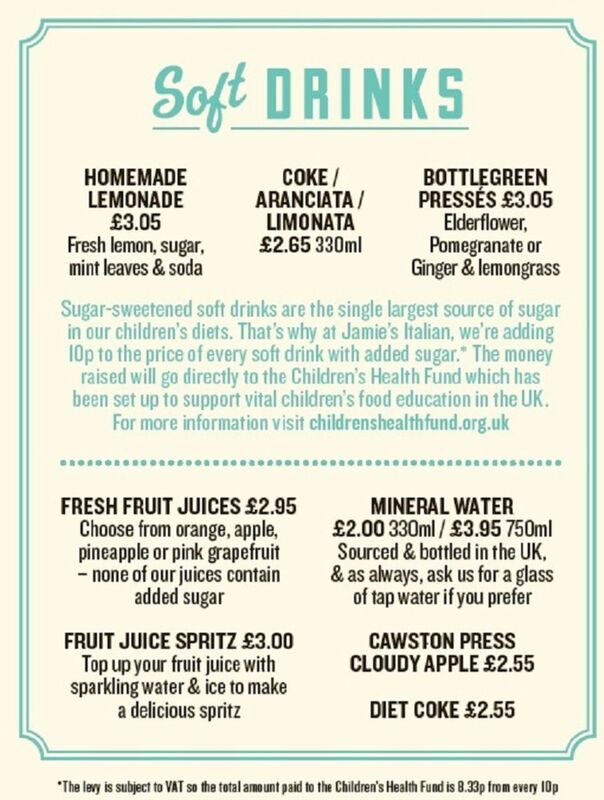 In combination with the introduction of the levy, Jamie’s Italian reorganised the non-alcoholic beverage menu into two sections: SSBs and other beverages (juices, bottled waters and diet cola). In addition, fruit spritzers (fruit juice mixed with water) were added to the main non-alcoholic beverage menu. Text (see figure 1) on the SSB section of the non-alcoholic beverage menu explained the decision to implement the levy and that proceeds from the levy would go directly to a Children’s Health Fund that offered grants for children’s health initiatives. Introduction of the levy was supported by a Channel 4 television documentary ‘Jamie’s Sugar Rush’, first broadcast on 3 September 2015.19 Thus, the levy can be seen as a complex ‘intervention’ comprising a fiscal component (a price rise) in combination with other non-fiscal components that could plausibly help reduce purchases of SSBs. Non-alcoholic section of the beverage menu. Reproduced with permission by Jamie’s Italian Restaurants. We take advantage of this natural experiment to assess whether the implementation of the levy in combination with non-price activities (for convenience referred to as the ‘intervention’) is associated with changes in sales of non-alcoholic beverages. We use an interrupted time series (ITS) design to compare the number of SSBs, and other non-alcoholic beverages, sold per customer before implementation of the intervention with sales at 12 weeks and 6 months after. We use itemised electronic point of sale (EPOS) data and investigate the effect of the intervention across all restaurants and whether this effect varies by tertiles of baseline restaurant SSB sales per customer. Itemised time-series data on the number of all non-alcoholic beverages sold in each of 37 eligible restaurants were extracted from the Jamie’s Italian EPOS system (MICROS Retail Systems) and provided to the authors by the company. To be eligible for inclusion, restaurants had to be operating between 23 June 2014 and 28 February 2016. To assess short-term (12 weeks) changes in sales, we used restaurant-aggregated itemised weekly data on the number of beverages sold from 8 June 2015 to 22 November 2015 in 37 restaurants. This equated to a time series of n=24 weeks, with 12 weeks of data either side of the implementation date of the intervention. To assess medium-term changes in sales at 6 months, we analysed the itemised number of beverages sold over 23 periods of 4 weeks each, starting from 23 June 2014 to 28 February 2016, from each of the 37 restaurants. These 4 weekly periods are standard company accounting periods, and we used data from the maximum number of periods available through the EPOS system. As the implementation date (1 September 2015) of the levy fell in the middle of a 4-week accounting period, data for that period were split into 2-week periods to allow for the specification of an exact implementation date in analyses. The numbers of beverages sold were standardised by adjusting for the number of customers visiting each restaurant. To do this, we divided the number of beverages sold by the number of ‘covers’ for each restaurant (one cover is equal to one adult or child customer) in each period, including the period split in two. Non-alcoholic beverages were separated into two main groups: on-menu and off-menu. On-menu refers to beverages present on the restaurant beverage menu (see figure 1). Off-menu refers to beverages that could be requested by the customer but were not listed on the menu. For the on-menu group, beverages were split into five categories: (1) SSBs subject to the levy, (2) fruit juices, (3) fruit juices on the children’s menu, (4) diet cola and (5) bottled water (see online supplementary appendix 1). Beverages not listed on the menu were split into two categories: (6) SSBs subject to the levy and (7) ‘mixers’, which were not levied. In addition, separate categories were created for fruit spritz (a mix of water and fruit juices), beverages, introduced to the main menu when the intervention was implemented and children’s ‘fruity water’ and milk, introduced to the children’s menu in June 2015. This categorisation allowed assessment of the main effect of the intervention on sales of SSBs and exploration of possible substitution effects. Data on tap water orders were not recorded through the EPOS system. A further 1.3% of all drinks sold during the study period were excluded as they did not fit the categories above (eg, slim-line tonics, smoothies and cordial drinks). First, changes in the number of non-alcoholic beverages sold per customer across all restaurants at 12 weeks and 6 months were explored. Second, these analyses were stratified by tertiles of baseline restaurant on-menu SSB sales per customer (low: n=12 restaurants; medium: n=13 restaurants; and high: n=12 restaurants) and assessed at 6 months only. Online supplementary appendix 2 lists the locations of included restaurants. Changes in non-alcoholic beverage sales associated with the intervention in the ITS were modelled as an immediate step change in the log-transformed number of beverages sold per customer. The step change was defined as a categorical variable equal to zero before implementation (up to 31 August) and one afterwards. This assumes an immediate and stable effect of the intervention.21 We did not analyse changes in trends as the postintervention period was too short for meaningful interpretation. Estimates using weekly data were adjusted for time trend in number of beverages sold per customer and estimates using 4 weekly data additionally adjusted for quarterly seasonal effects (see online supplementary appendix 3). Analyses of aggregated weekly data were conducted using simple linear regression as data were only available at the aggregate level (ie, for 37 restaurants combined). Analyses of 4 weekly data were conducted using a hierarchical multilevel model with restaurant-specific random effects in intercept and trend. We report robust standard errors to account for residual autocorrelation and clustering. Magnitude and statistical significance of the coefficient of the categorical variable was used to assess the changes associated with the intervention (see online supplementary appendix 3 for details on the model). Estimated coefficients were exponentiated and expressed as a percentage change in the number of beverages sold per customer. Sensitivity analyses were conducted that tested the robustness of the timing of the effect by varying the date of implementation to the month preceding and following introduction of the intervention (see online supplementary appendix 5). In the 12 months prior to the introduction of the intervention 2 058 581 non-alcoholic beverages were sold within study-eligible restaurants, of which 38% (n=775 230) were SSBs. Table 1 shows the mean number of beverages sold per 4-weekly period in each category per restaurant and per customer. Before and after the introduction of the intervention, SSBs were the most commonly purchased non-alcoholic beverage per restaurant and per customer, followed by bottled water and diet cola. On a per-customer basis, after introduction of the intervention, an increase in the mean number of fruit juices (main menu) sold and reductions in the SSB, diet cola and children’s fruit juice categories were observed. Table 2 reports the mean number of newly introduced beverages (fruit spritz, children’s fruity water and children’s milk) sold per 4-weekly period by restaurant and by customer. Compared with existing beverages, overall sales of these new beverages were low. Table 3 reports the percentage change in the mean number of beverages sold per customer at 12 weeks and 6 months after introduction of the intervention across all restaurants, compared with the preintervention period (see online supplementary appendix 4 for graphs of time series data). At 12 weeks, the intervention was associated with an 11.04% (95% CI −17.30% to −4.30%; p=0.003) decrease in the mean number of on-menu SSBs sold per customer compared with the 12-week period preceding the intervention, adjusting for trend. At 6 months, change in sales was smaller, with the intervention associated with a 9.34% (95% CI −15.21% to −3.15%; p=0.004) decrease in mean number of on-menu SSBs sold per customer. No changes in sales of off-menu SSBs were observed. Changes in sales at 6 months differed by tertile of baseline restaurant SSB sales per customer. Table 4 shows that the intervention was associated with a 12.8% (95% CI −19.27% to −5.82%; p=0.001) reduction in the number of on-menu SSBs sold per customer in high SSB sales restaurants and a reduction of 16.47% (95% CI −20.55% to −12.19%; p<0.001) in medium SSB sales restaurants, compared with the preintervention period. No changes in sales were observed in low SSB sales restaurants. In medium SSB sales restaurants, introduction of the intervention was associated with a 11.40% (95% CI −17.30% to −4.97%; p=0.001) fall in the number of off-menu SSBs sold per customer, but no association was found in either low or high SSB sales restaurants. Table 3 shows that the intervention was associated with increases and decreases in the number of non-levied beverages sold per customer at 12 weeks and 6 months, compared with the preintervention period. At 12 weeks, the intervention was associated with a 21.53% (95% CI 8.22% to 36.62%; p=0.002) increase in the number of off-menu mixers sold per customer and a 34.69% (95% CI −55.43% to −4.30%; p=0.031) decrease in the number of children’s menu fruit juices sold per customer. At 6 months, the intervention was associated with an increase of 21.77% (95% CI 14.00% to 30.21%; p≤0.0001) in the number of fruit juices (main menu) sold per customer. However, the number of children’s menu fruit juices sold per customer decreased by 9.88% (95% CI −16.81% to −2.37%; p=0.011), diet cola decreased by 7.32% (95% CI −11.66% to −2.76%; p=0.002) and bottled water decreased by 6.48% (95% CI −11.04% to −1.69%; p=0.009). Stratified analysis (table 4) showed that the intervention was associated with an increase in the mean number of fruit juice (main menu) beverages sold per customer across all tertiles, with the largest increase of 34.99% (95% CI 18.77% to 53.42%; p<0.001) observed in restaurants with the lowest baseline SSB sales per customer. There were decreases in the numbers of diet colas and bottled waters sold per customer, but associations were primarily observed in restaurants with medium baseline SSB sales. An association between the intervention and a decrease in the mean number of children’s fruit juices sold was observed in restaurants with the highest baseline SSB only (−14.36; 95% CI −22.04% to −6.01%; p=0.001). Sensitivity analyses of the robustness of the timing of the changes associated with the intervention confirmed the strongest effects at the actual time of the implementation (see online supplementary appendix 5 for supplementary data). The introduction of a the £0.10 levy on SSBs combined with other supporting activities in Jamie’s Italian restaurants was associated with an 11.04% decrease in the mean number of on-menu SSBs sold per customer at 12 weeks and a 9.34% decrease at 6 months. Decreases at 6 months were only observed in restaurants with medium and high baseline SSB sales per customer, suggesting that the intervention may be more effective in restaurants with higher underlying sales of SSBs. Our analyses show a step decrease in number of SSBs sold per customer, and sensitivity analyses suggests this decrease occurred at time of implementation. This locates our observed changes at the point of the intervention’s introduction and strengthens the case for it being the likely explanation for our observed changes, rather than a general secular decline or as a result of other unobserved external factors. We observed a general decrease in numbers of non-alcoholic beverages sold per customer, with the exception of fruit juice, postintervention. This is counter to evaluations in other settings, such as Mexico, where there have been increases in sales of diet beverages and bottled water as substitutes for SSBs.12 Here, the provision of new beverage options and orders of tap water may have acted as substitutes and may partially account for the decline in sales of levied SSBs and other soft drinks. However, this is unlikely to be the sole explanation for the observed decline. Declines in SSBs sales were greater than declines in sales of other beverages, suggesting that other elements of the intervention (beyond provision of new beverage options) may be important. The changes observed in this study are relatively large given the size of the levy. However, recent evidence from Berkeley, California,18 showed that changes of the magnitude reported here may be plausible even when price rises are relatively small (21% decrease in sales in response to a penny-per-ounce tax18). Economic modelling and other evaluations suggest that sales reductions are similar in magnitude to the price change (a price elasticity of 0.8–1.2).12 23–27 In this study, we observed a decline in sales of 10%–12% in response to an average price increase of 3.5%. While this difference could be due to price elasticities cited above being estimated using supermarket purchase data in more aggregated groupings and where such drinks are considerably cheaper, it could also suggest that changes observed here may not be entirely due to the price increase. A range of complementary activities were implemented alongside the levy, including beverage menu redesign, donation of proceeds to a children’s health fund, new beverages and widespread media coverage. The Jamie Oliver ‘brand’ is also associated with campaigning on food and health issues. These factors may have acted in combination with the price increase suggesting that multifaceted interventions with a fiscal measure at their core may plausibly affect behaviour and have greater effects than interventions comprised solely of a fiscal component. Research on the introduction of nominal taxes on single-use plastic bags suggests that psychological processes are important contributors to intervention effectiveness by modifying habitual behaviours through contextual change.28–30 In the case of plastic bags, contextual change comprises a nominal tax and a prompt at point of sale asking customers if they wish to purchase them. In economic studies of taxes on alcohol, price tags marked as ‘tax-included’ on the shelf reduces sales at a greater rate than when supplementary taxes are applied at the cash register only.31 Similar processes may be in operation here. In addition to the levy on SSBs (the price component), the non-price components can be seen as important elements of ‘contextual change’ that may prompt customers to adapt their behaviour either to avoid the levy for economic reasons or to bring their behaviour in line with underlying latent values. Our study has several strengths. First, we use itemised objective data on all non-alcoholic beverage sales to assess changes in numbers of drinks sold after the intervention was introduced. This allowed categorisation of individual beverages into appropriate analytical groups. Second, using a panel format, we were able to control for variations in customers in different restaurants via restaurant specific random effects over time. Third, we were able to analyse changes using weekly and 4-weekly data. Both showed robust associations between the intervention and decreases in SSB sales, accounting for underlying trend. Limitations included being only able to adjust numbers of beverages sold by the overall number of customers, as disaggregated data on the number of adults and children visiting each restaurant are not routinely collected. Variations in the number of children visiting restaurants, beyond time and seasonal influences, may have biased estimates of changes in sales. Second, we could not model impacts using a price variable, as beverage prices did not vary across restaurants. Third, while for most restaurants the model fitted the 4-weekly data well, for three restaurants the fit was poorer. These were retained in the sample, as there was no indication that systematic errors were present in the data. As data are in 4-weekly periods that did not correspond to calendar months, we could not use external control variables to adjust for wider trends in beverage or hospitality sector sales. Finally, this study was undertaken in one chain of restaurants, limiting generalisability. There is consistent evidence that reducing consumption of SSBs would be beneficial to health.1 2 14 15 Fiscal measures could discourage SSB purchases, and even small price changes may plausibly reduce sales.18 35 Our findings suggest that the introduction of a small levy on SSBs combined with non-fiscal complementary activities is associated with declines in SSB sales when delivered at scale in a commercial restaurant setting. Further research evaluating such interventions in other restaurant settings, with a longer follow-up, is required to assess whether this is transferable, whether decreases in sales are sustained and whether reductions in sales translate into reductions in SSB consumption and to explore whether changes differ by population subgroups. The WHO recently advocated the use of fiscal measures, such as taxes, to reduce the consumption of sugar-sweetened beverages (SSBs). While the potential impacts of SSB taxes on sales and consumption of SSBs have been estimated using modelling studies, primary studies evaluating the effects of such interventions delivered in a real-world settings are rare and have only been undertaken in countries with high consumption of SSBs (USA and Mexico). No evaluations of fiscal interventions have been undertaken in the UK where SSB consumption is lower or have been delivered at scale in commercial restaurant settings. At 12 weeks, sales per customer of SSBs had declined by 11% and at 6 months by 9.3% compared with the preintervention period. Reductions were the greatest in restaurants with higher SSBs sales per customer. The effects observed in this study were relatively large, which suggests that complementary activities associated with its introduction (eg, menu redesign, introduction of new beverages and information) may have the potential to augment changes induced by price increases. The authors would like to thank Louise Ludlum at Jamie’s Italian and Jo Ralling at The Jamie Oliver Foundation for allowing access to the commercial sales data used in this study. In particular, we would like to thank Michelle Fisher for extracting data from the MICROS Retail System. We would also like to thank Ben Reynolds and Gloria Coates-Davies of SUSTAIN for facilitating this research. Public Health England. Sugar Reduction: the evidence for action. London: Public Health England., 2015. https://www.gov.uk/government/uploads/system/uploads/attachment_data/file/470179/Sugar_reduction_The_evidence_for_action.pdf (Accessed 18/10/2016).
. Taxes on unhealthy food and drinks. BMJ 2012;314:e2931.
. Overall and income specific effect on prevalence of overweight and obesity of 20% sugar sweetened drink tax in UK: econometric and comparative risk assessment modelling study. BMJ 2013;347:f6189.
. Ferreira the most popular tax in Europe? Lessons from the Irish plastic bags levy Environment and Resource Economics 2007;38:1–11.
. Gluttony in England? Long-term change in diet IFS Briefing Note BN142: Institute for Fiscal Studies, 2013.
. The strategy of preventive medicine. Oxford: Oxford University Press, 1992. Contributors SC conceived the study, directed analyses, interpreted results and drafted the paper. LC conducted analyses, interpreted results and drafted the paper. MW, AG, JA, OTM, RS, CT, DI, CK, MP and CS helped design the study, interpret results and commented on drafts of the paper. SC is the guarantor of the study. Funding This study was funded by the UK National Institute of Health Research (PHR 15/124/01) and the UK Medical Research Council (MRC Strategic Skills Fellowship to LC). JA and MW are funded by the Centre for Diet and Activity Research (CEDAR), a UKCRC Public Health Research Centre of Excellence. Funding from the British Heart Foundation, Cancer Research UK, Economic and Social Research Council, Medical Research Council, the National Institute for Health Research and the Wellcome Trust, under the auspices of the UK Clinical Research Collaboration, is gratefully acknowledged. None of the authors were involved in the design or the implementation of the levy by the restaurant chain. The evaluative study was conceived postimplementation of the levy. The authors had full access to all the data in the study and had final responsibility for the decision to submit for publication. SC confirms that the manuscript is an honest, accurate and transparent account of the study being reported; no important aspects of the study have been omitted; and any discrepancies from the study as planned have been explained. Disclaimer The funders of the study had no role in study design, data collection, data analysis, data interpretation or writing of the paper. The Jamie Oliver Foundation, Jamie’s Italian and their employees had no role in the study design, data analysis, data interpretation or writing of the paper. Ethics approval Ethical approval was obtained from LSHTM Research Ethics Committee. Data sharing statement The dataset used within this study is commercially sensitive and is owned by a third-party. The data provider (Jamie’s Italian) will accept requests to access to sales data used in the analyses presented here. These requests should be made in writing to the Jamie Oliver Food Foundation (http://www.jamieoliverfoodfoundation.org.uk).